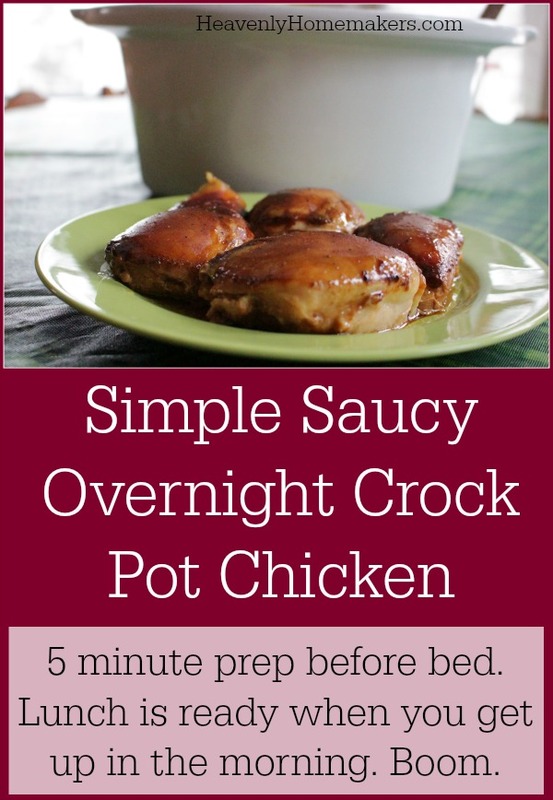 This Simple Overnight Saucy Crock Pot Chicken idea might be one of my favorite Simple Tips/Recipes of the new year! It takes five minutes of “work” to make this before you go to bed at night. It’s brainless. It involves no measuring or dirtying of dishes. You can practically sleep walk your way around this (which is precisely how I do everything after 10:00 pm). Best of all: No chickens have to be thawed in the making of this recipe. It was a cold, windy, dark Friday night (adjectives added for dramatic effect). It had been a long, exhausting, busy week (and this is different from other weeks, how?). Saturday, we had a full day of basketball games scheduled in a town two hours away. We needed to pack breakfast to eat on the way and lunch to eat between games. Friday night we were finally getting around to figuring out food for the road the next day. We have learned that big, meaty chef salads between basketball games are great for our boys who need to eat something substantial and full of protein, but not terribly heavy. So I dumped some frozen, raw, boneless chicken thighs into the crock pot, dumped on some BBQ sauce, plugged in the crock pot (always, always plug it in), turned it on (also important), and went to bed. The next morning the house smelled marvelous. After all, I had been slow-cooking BBQ Chicken all night – like a boss – while I slept. The end of this story was supposed to include the fact that we quickly shredded the chicken in the morning and made ourselves some wonderful chef salads before heading out the door for the day. But as it turned out, the weather was terrible, the games were canceled, and the boys got so excited about the chicken when they got out of bed that they ate it for breakfast. Who am I to say no? I wanted some too. Place frozen chicken in a crock pot. Pour sauce over the chicken. Cook on low for 7-10 hours overnight. Go ahead and eat it for breakfast. Sometimes this can’t be helped. Do you end up with a lot of liquid in the crock when it’s done? I make shredded BBQ chicken, with boneless breasts, but if I put the sauce in at the beginning, I just have a very watery sauce at the end. I love using my crock pot! Some liquid, but I like that so that we can shred the chicken into all the liquid and it’s super juicy! Do you make BBQ sauce ahead of time and just keep it in the fridge? I LOVE your BBQ sauce! It’s the only one I use but it would be so much easier to have it made ahead of time! I don’t always have it made ahead of time, but it is AWESOME when I do! Makes it so easy! Oh Laura, I had to laugh so hard about the part of not forgetting to plug in the crock pot! I have done that before – gotten all excited about having a tasty meal later and then 4 hours later realizing that it’s not cooking because I didn’t plug it in! On a sadder note that I’m sure you will appreciate – my crock pot had to be retired the other day. So terrible! It’s the one I got when I got married but when I went to use it last week I realized that there were some exposed wires that couldn’t be fixed. I’m not about to burn down the house with a defective crock pot so we had to say goodbye! I couldn’t believe how attached I was to it. Hubby went out the very next day to get me a new one (great guy!) but alas, it is defective. So now I have to return it and I went out yesterday to get a new one – again. I hope that I can finally use it again! What a crazy business!